Jean “Django” Reinhardt became known for creating new chords on the guitar that he was able to play with his injured hand. There are close to 5 billion videos watched every day on YouTube. A YouTube video can go viral and propel an unknown from total obscurity to world fame in a matter of days. In 2012, the music video “Gangnam Style” by Korean pop singer-rapper PSY rocketed around the world with over 1 billion views in less than five months (now at 3 billion and counting), propelling him to world fame. PSY quickly faded away as the next YouTube phenome took center stage, something that Andy Warhol anticipated in 1968, well before YouTube existed, when he famously predicted that culturally speaking, fame would be limited to 15 minutes. 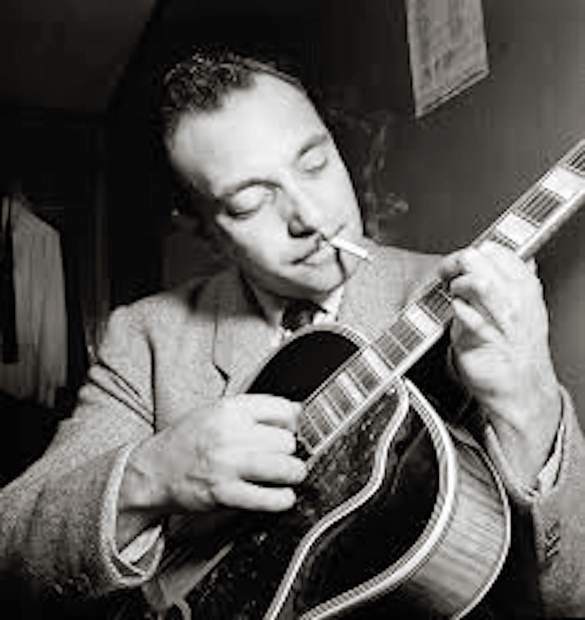 Contrast PSY’s career and music with that of Jean “Django” Reinhardt, a Belgian born (1910) self-taught Gypsy musician. Django moved to Paris as a child and earned a living as a teenager playing on the streets of the City of Lights, before playing in dance halls and performing a style of music known as musette, a combination of French folk music, polka, waltz and jazz. It is doubtful that Django ever learned to read books or music and in 1928, at the age of 18, he was severely burned in a fire in his caravan. The fourth and fifth fingers on his left hand were paralyzed and he never recovered the full use of them. Not able to use all the fingers on his left hand to play chords on his guitar, he created new chords using his contorted figures where possible, while rapidly moving his good fingers up and down the neck of the guitar, inventing a truly unique technique. In 1934, he joined forces with Stephane Grappelli, a French-Italian violinist, and they formed the “Quintette du Hot Club de France,” synthesizing the music of Django’s Gypsy heritage with jazz to create a ground breaking sound that would have worldwide impact, making both of them internationally famous. Combining three guitars with a violin and bass, Django created what became known as “Gypsy Jazz” and is now known as “Django Jazz.” Tragically, Django died of a brain hemorrhage in 1953 at the age of 43, the most important European jazz musician ever and a guitarist who influenced successive generations of guitar-greats. Once Django passed, his music was forgotten, as bebop jazz took hold and the tsunami of rock washed over the world of music. However, a decade after Django’s passing, his music began to be revived. Instead of a short-term revival based upon reminiscence, his music began to take hold and build momentum. For the past five decades, there has been a phenomenon aptly described as “Djangomania,” with Django Jazz played and enjoyed throughout the world, entire jazz festivals dedicated to Django and his music throughout the U.S. and Europe. There was, of course, no internet, so Django Jazz couldn’t go viral, but that really didn’t matter, because ultimately, Django and his music have passed the test of time. Greatness is not based upon a viral video, no matter how many views, but instead on the creation of something of lasting value — a musical legacy — something that will be handed down to future generations. “Gangum Style,” on the other hand, will be, at best, a historic footnote about the first video to have more than a billion views. Django and his music have entered the pantheon of popular music of the Western world and “Django Style” (contrasted with “Gangam Style”) is now part of the classical music of the last century. It has something special that will endure. Howard Stone is the founder and artistic director of Vail Jazz, the presenter of the annual Vail Jazz Festival each summer and an annual Winter Jazz Series, both of which feature internationally renowned artists. In addition, Vail Jazz presents educational programs throughout the year with a special focus on young musicians and young audiences. Many of Vail Jazz’ performances and educational programs are presented free of charge. This column is readapted from the original archived edition, republished to commemorate Vail Jazz’ 25th anniversary season in 2019. For information about upcoming performances, visit http://www.vailjazz.org.